Bayer 04 Leverkusen have ground to make up on third-placed Hertha Berlin. 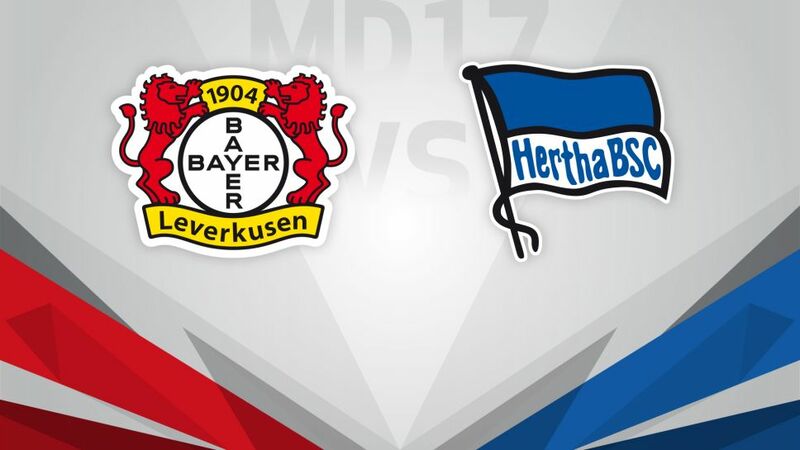 Bayer 04 Leverkusen play catch-up when they host high-flying Hertha Berlin at the end of the Hinrunde this Sunday (kick-off 15:30CET/14:30GMT). With more losses (seven) than wins (six) ahead of the winter break, Leverkusen will be looking to even up their account when they close out the Hinrunde at home on Sunday. Just prior to the winter break, Bayer drew at 1. FC Köln, but had lost at home to relegation-threatened FC Ingolstadt 04 a few days earlier. The team's preparations for the restart have shown promise for improvement on their current ninth place. The squad is fit and talismanic striker Javier 'Chicharito' Hernandez returned to goal-scoring ways in a friendly against Brazilian side Atletico Mineiro at the Florida Cup. For their part, Hertha will seek to build on finishing 2016 in third place in the standings. Pal Dardai’s men had an up-and-down December: they picked up wins against VfL Wolfsburg and SV Darmstadt 98, but lost to SV Werder Bremen and RB Leipzig in between. The Old Lady's personnel situation is rather trickier than Leverkusen's: Salomon Kalou is away at the Africa Cup of Nations 2017 and Mitchell Weiser remains out of action.